This weekend in the Sunday Times, there was a depressing article about household debt. It was written on the back of a survey taken by people who intervene in these situations, and have a professional interest in “laying it on”. Against that, the Research Institute of one of the top banks in the world, Credit Suisse, tells another story all together, which Business Day published on the weekend. South Africa’s average household wealth has fully recovered from the global financial crisis, quadrupling from $8400 in 2000 to $34300 by mid-2011, a report by the Credit Suisse Research Institute shows. The second annual Global Wealth Report, released this week, estimated there were now 71000 dollar millionaires in South Africa and projected that this number would triple in the next five years to 242000. South Africa was also home to 116000 members of the top 1% of households which own 38,5% of global wealth, and the country was the 17th-largest contributor to wealth growth globally. Despite South Africa’s status as one of the world’s most unequal societies and the effect of the financial crisis on job losses, the period had coincided with considerable progress in improving the living standards of South Africa’s poorest, Frans Cronje, deputy CEO of the South African Institute of Race Relations, said yesterday. “No doubt this improvement in living standards was almost entirely due to the transfer of wealth from those earning money to those who were not,” he said. The roll-out of social welfare had resulted in a “remarkable” decrease in the number of absolutely poor people and South Africa had registered enormous progress in terms of service delivery, “contrary to what people believe”. The report projects global wealth to rise 50% in the next five years to $345-trillion, equivalent to 8,4% growth a year. Wealth per adult worldwide is expected to reach $70700 in 2016, an increase of 40% over 2011 while household wealth in Africa will rise by more than 90% to $5,8-trillion in 2016. This year Europe surpassed North America (37%) in making up 37,2% of all millionaires in the world. In Asia-Pacific, Japan ranked first with 11% or 3,1-million millionaires, followed by Australia and China, with 1-million each. Larry Masson, a wealth manager at FNB Private Clients, said in terms of household wealth growth in the last decade the report was spot on with all levels of society seeing “exceptional growth in income”, although some from an admittedly low base. He said household wealth growth in SA would, as ever, be tied to the performance of the global economy, which was far from certain. As the Emperors Palace Ready To Run Sale approached, we repeatedly spoke of our unshakeable belief in the courage and foresight of our fellow South Africans. There were many who might’ve felt we were overly optimistic. But overcoming adversity is not new to our countrymen. We’ve had to deal with major crises in the past, and we know what it takes. While the outcome of the Sale exceeded our expectations, it was just another great case of South Africa at work. People looking forward, knowing that next year is next year, that there’ll still be Julys, Mets and Summer Cups to be won. People with vision, with guts and a love of our game. Like few others anywhere. Racing people appreciating good horses, fine horsemanship and relishing the challenge. For the lion’s share of the spoils at next year’s “Emperors Cup”. For a million and a half. So from the Number One Farm in South Africa to the Number One Nation on Earth, Thank You. Where you’d be forgiven for believing, if it weren’t prescribed subject matter at every mealtime, that talk of plunging markets and financial destitude, were not just that: “talk”. In the rudest of good health (at 8kgs trimmer than we last found him), and on a twelve week “wagon”, STRONGHOLD’s investor, Rupert Plersch was in great form with a sparkling new set of Jaguar wheels, while Herman Brown Jnr’s adherent, Terry Bowley shares Rupert’s fondness of South Africa. These are two extraordinarily successful entrepreneurs, whose enterprise has lured them to a far away land in search of a world that has not only brought financial reward, but a way of life that has opened their lives to the broader reaches of the earth. Any result that moved into positive territory within a few days of “Black Monday”, the world’s toughest day in financial markets in more than 70 years, was bound to provoke interest. But a racehorse sale posting a 48% increase over two prior years which were both more than 40% up on their predecessors, was quite something, “defying gravity” as Mala Mala’s Mike Rattray put it. That was the Emperor’s Palace Ready to Run Sale, 2nd November 2008. In our own 30 years in the game, we’ve never known such generosity from the marketplace, with e-mails and SMS’s coming in every few minutes for a couple of days. Inevitably, as is the case with the head of any organisation, much of the credit has been laid at my personal door, yet as we’ve so often pointed out in the past, Summerhill’s is a uniquely team effort, where the space created by others doing their jobs especially well, makes it possible for the rest of us to focus intensely on the job at hand. And of course, this was a job that did require an intensity of an unusual kind, but we were helped in our purpose by an unusually smart draft of horses; by the skills of an unusually talented team of horsemen, and by a nation whose countrymen are endowed with gifts of unusual courage and farsightedness, who know that there’s an end to this financial madness, and that next year there’ll still be big races to be won, and a World Cup to prepare for. Yet here we were dealing in animals at the top end of the luxury goods business, and any result of this magnitude is a landmark of the trade. So it’s time again for our team at Summerhill to take another bow. It’s amazing what you can achieve when it doesn’t matter who gets the credit. Have you ever been to Summerhill? There are those who’ll tell you it’s one of the rare places on earth. That it has a soul so deep and so spectacularly surprising. That its originality and its history are defining dimensions. That for all its “busyness”, it also has its sanctuaries, hideouts and nesting places for our wild friends and their natural habitats. Places we look after by leaving them strictly alone. And then there are things we never let go, like www.summerhill.co.za . For those of our pals with the frenetic timetables, of the civilized, increasingly crowded and belligerent world, who “visit” us for their daily rush of racing’s news, views and the business of breeding, we’ve installed the most advanced therapy in the technological world. Many will tell you that if you’ve never been to Summerhill, you’ve hardly been anywhere. Imagine the stories you could tell if you had. And while you can never beat the real thing in the real world, the virtual one will do for now. It’s a little known fact that following the alarming events which ensued in South Africa in the latter part of 1989, with the collapse of the Rand on the default of the nation’s international debt repayments, that the enterprise of this business initiated a delegation to England to attract people into racing and breeding in South Africa. Such a success was the visit that among those who were lured to the southernmost tip of what our civilized neighbours to the north call the “darkest continent”, were the Maktoum family, whose association with this farm celebrates 20 years next March. Besides the horses belonging to Dubai Rulers, Summerhill has become home to more than 300 thoroughbreds belonging to friends and investors spanning seven time zones, including Australia, New Zealand, Hong Kong, Dubai (of course), Saudi Arabia, Kenya, Zimbabwe, Monaco, France, Germany, the United Kingdom and the United States. It’s remarkable what you can achieve when you’re desperate, and today it’s a source of pride at the farm to know that this is the largest concentration of foreign owned thoroughbreds on any one property, anywhere in the world. You’d sometimes have to ask yourself (if not pinch yourself) what it is that attracts these people into keeping their horses here so far from their homes, and it’s probably an answer that lies in the long history of the province of KwaZulu Natal. Let’s not forget that the Zulus who populated this area almost 1300 years ago, fought tooth and nail, in the first instance to amalgamate their own nation, and thereafter to preserve the territory they owned, against all odds. In the early 1800’s with the influx of European migrants principally from Britain and Holland (in the form of the Boers,) dominion over what was seen as some of the finest and most productive farm land in the world suddenly become an issue, to the extent that three nations (the British, the Boers and the Zulus) witnessed the greatest moments in their respective military histories within two hours of Summerhill. The great battles of Isandlwana and Hlobane, Rorke’s Drift, Colenso, Majuba and Spioenkop sit deep in the breasts of these people, while its an intriguing fact of history that the greatest Englishman of all-time, Winston Churchill and the greatest African of all time, Nelson Mandela, were both captured within half an hour of Summerhill in 1899 and 1961 respectively. Don’t forget though, the liberator of India, Mohandas Ghandi, spent 22 years in this province, and that he turned up the battle of Spioenkop as a stretcher bearer in a scrap he had nothing to do with. What was it then, in the subconscious of these people that attracted them here, and continues to tug at the heartstrings of the many who are part of the Summerhill story these days? We guess it must have something to do with the splendour of our environment, one of the best climates in the world, and of course, the people who live and work here. The Zulus are some of the most enchanting, respectful and hard-working people in the world, and it’s a tribute to their creativity and their appreciation of the performing arts that our little dance troupe, which has already ranked second and third respectively in the World Traditional Championships in Tokyo and Hong Kong that they’re off to the United States towards the end of the year as cultural ambassadors for South Africa. This time, though, we think they could come home the World Champions. It’s always interesting (and often flattering) to know that, at the southernmost tip of what the civilized world calls the “Darkest Continent”, there’s something which may intrigue those in supposedly more civilized climes. We’ve noticed from those that visit our website, that auction companies of the eminence of Keeneland in the United States, Inglis and Magic Millions in Australia and Irish Thoroughbred Marketing (obviously in Ireland), are regular visitors, curious as to how we go about marketing the Emperors Palace Ready To Run Sale. One of the principal cogs in the Irish wheel, Marketing Manager Eamonn Cullen, confessed yesterday that he visits us twice a week for his “fix” on what we’re up to, and he’s been genuinely generous in his admiration. While we think we’re making a fair job of it, there are always new depths to plumb and new lessons to be learnt, and if any of our readers have any ideas for us, we’d be more than delighted to hear from you. The business of breeding in the first half of the last century was the preserve of proper horseman, steeped in the tradition of producing and raising animals, in particular those of the equine species. The game has changed. Whereas the welfare and development of the Thoroughbred rested in the initial two and a half centuries, in the hands of the British aristocracy and subsequently in those of people who could afford to do it for the love of the game, rather than for its commercial benefits laterally, the business has been hijacked by “venture capitalists”. While there have been obvious benefits accruing from this turn of events, especially regarding the value of horses and the viability of the businesses producing them, it may have had an impact on the type of horse we produce and in particular, his durability. When the motive behind the sport was the competition involved in beating your colleague, the intent behind breeding a racehorse was the production of an animal that could run faster for longer than the next one. That’s changed dramatically, and today, it seems that the greater influence in the minds of the breeders is largely what the progeny will yield in the sales ring. Besides increasing the dearth in the availability of quality horsemen these days (many have left our ranks for other attractions in the economic environment), there are other considerations that compromise the soundness of an animal, including the urgent need to develop as big and precocious a product by the time the horse gets to the sales. The commercial imperatives are such that just about everything else that matters in the development of the athlete is forgotten in the process, and so, when it’s all taken its course, we’re left with the hope that besides being the “business” when an animal gets to auction, it still has the ability to run on top of it. Financial considerations have also brought about the dispersal of the great thoroughbred families that used to comprise the private studs of the big owner-breeders of their era, so that the luxury of developing these families in a “closed herd” environment has all but disappeared. In the South African context, there are just a handful of people still in a position to produce horses for the sake of the sport of racing, and here we speak of people like Bridget Oppenheimer, Gaynor & Johann Rupert and Sabine Plattner among very few others. Rewind three or four decades, and the scene was distinctly different. In our own district alone, we recall the great private breeding establishments of the Ellises (the most successful owner-breeders of their era right here at Hartford which, for those who are not familiar with it, forms part of the greater Summerhill estate), the Labistours, who dominated the Durban July in the 50’s from their Dagbreek Stud in Nottingham Road, Joyce Tatham’s Springfield Stud and Harry Barnett’s Springvale Stud. There were several others besides the Oppenheimers in other regions including the Armitages’ Rathvale Stud in the Eastern Transvaal, but the times they’re a changing. Today we’re down to just a handful of these noble people, as we’ve said. Every other establishment has to make a profit, and increasingly, the principles involved in producing a sound, durable athlete are being compromised in the interests of the outcome in the sales ring. Claiborne Farm is one of the most distinguished American breeding establishments, and it’s been in the hands of the Hancock family for four generations. One of the late, great “Bull” Hancocks sons, Arthur (owner of Stone Farm in Kentucky, and the breeder of two Kentucky Derby winners) proffers the view that overbreeding (the practice of committing hundreds of mares to a stallion in a single season) is also having its impact, though how precisely this comes about is not entirely clear to us. Presumably what he means is that the bigger a stallion’s book, the less the quality of the mares, and while that’s logical, those mares would’ve been sent to other stallions otherwise, and we guess that whether or not they produce sound progeny depends on whether or not they were wisely mated. The end result would be the same, all things being equal, whether they went to one stallion or were dispersed among a number of stallions, as the number of resultant progeny, give or take a few from a fertility perspective, would be very similar. The biggest impact on American breeding however, must flow from their medication policies. Distinct from most countries of the world, certain states permit liberal pre-race medication of horses aimed at either masking or reducing “soreness”, or staunching bleeding, with the result that breeders who use horses that have been treated in this way for stud purposes, are bound to be perpetuating in their progeny whatever weaknesses those horses suffered from during their racing careers. There is little doubt that with the passage of time, this must have a deleterious impact on the breed, and it’s probably the single most important feature, in American breeding at least, in weakening the end product. Of course, American blood is sort after the world over, and so there’s bound to be an impact in other areas of the globe as a consequence of this policy. Americans are going to have to concentrate increasingly on addressing this issue if they’re to maintain their position as purveyors of quality bloodstock to the rest of the world, and of course in the production of horses capable of competing on the international stage, free of medication, on an on-going basis. Back to South Africa, where in Summerhill’s real world, we hold the view that the demands of the commercial marketplace are the one factor that’s bound to impact on the soundness of our horses to a greater degree than any other. We undertake several thousand mating recommendations every year for prospective breeders and their mares prior to a breeding season, and the one question we’re asked more regularly by our correspondents than any other, is what they’re likely to get for the resultant foal when it gets to the sales. Mercifully, in our own deliberations on these things, we very seldom involve ourselves in what the foal is likely to make in the sales ring, but rather what sort of animal we’re likely to produce as a result of the mating. Our thoughts, as much by design as anything, revolve around the issue of producing a racehorse, and we’d like to think (perhaps naively) that in producing a horse of proper athletic proportions, we’re likely to get both a sound animal and one that will run for its owner when it gets to the racecourse, and that question, properly answered, should take care of the results in the sale ring. It obviously doesn’t entirely though, as we seem to battle to crack the “million” mark for our yearlings. That said, we’re doing well enough, and we sleep without conscience in the wake of a sale, knowing our horses represent value to those who’ve bought them, and that they have a more than even chance of turning out well when their big day comes first-time at the track. The Breeders’ log tells the rest of the story. Greig Muir and Barry Watson are at risk of ‘believing’ that they are indeed esteemed members of the Monarchy of the Basotho Nation, having just returned from what they describe as an “unbelievable” visit to the Mountain Kingdom of Lesotho. Barry writes as follows,”We stayed at the Royal Palace in Maseru, and what a Palace. Everything was embroidered with the Royal Coat Of Arms, even the tea-cups and saucers were sealed with the Royal insignia. And on our departure, when questioned by His Majesty as to whether we enjoyed our stay, the reply was quite simple, “We have been fed and kept like Kings.” His Majesty had a good laugh at that. The purpose of our visit was to assist His Majesty in converting the waste product produced by his poultry operation, ie. chicken litter, into an active ‘input’, or fertilizer, for his cropping operation. What a way to reduce pollution! For many years now, poultry producers in South Africa have capatilised on the idea of using chicken litter as a supplement in their cropping fertilizer programmes. Although the idea of taking a waste output from one enterprise for use as a source input for another is not new, with ever escalating agricultural input costs this concept is gaining increased momentum. Dairy farmers are also now factoring in the value of their milking parlour slurry when calculating pasture fertilizer requirements. Here at Summerhill, we have been following these principles for some time now. For the last fifteen years it has been common practice to put our winter bedding onto our summer pastures. After achieving positive results with this practice, and feeling quite clever about ourselves, we initiated a composting operation. Now this operation has not only helped in reducing our fertilizer bill, but for this year, has in part helped in eliminating it altogether. Click here to view Greig’s photos from the trip. The following is an extract from an article recently published by financial expert and best selling US author, John Mauldin. “I realized about halfway through my recent trip to South Africa that it had been some time since I was in an emerging-market country. I have been to over 50 countries over the past 20 years, but recently most of my travels have been to Europe and Canada, with the occasional vacation trip to Mexico. As I observed South Africa, it was forcefully brought home to me that there is more to the emerging-market story than China, India, and Brazil. There are any number of countries that are seeing robust growth and contributing to the world economy. It was reported at Davos this year that for the first time the developing world has a larger share of world GDP than the developed world. Today, we focus on an emerging-market country that does not make as much news as it should. As I mentioned above, the mood among those I talked with in South Africa in the early 1990’s when I was travelling often to South Africa was quite pessimistic. The economy was not good, due to international economic sanctions stemming from worldwide protests over the policy of apartheid. Changes and elections were coming, and it was not clear what would happen. I travelled for (mostly) business into 14 other sub-Saharan countries in Africa. With a few notable exceptions, most countries were not doing well and things had progressed from bad to worse over the previous 10-20 years. It was a tough time to try and do business, but it was a great education. The contrast today is amazing. Before we get into some facts, let me give you a few impressions. First, there are construction cranes everywhere in the four cities I visited: Johannesburg, Pretoria, Durban, and Cape Town. Twelve years ago the thirty miles from Johannesburg to Pretoria was mostly agricultural land. Today it is one big city, with offices, malls, and homes lining the freeway. There was a significant number of rather nice new housing developments, many if not most being built on speculation all along the freeway. Johannesburg is a world-class city, on a par with New York or London or any major city in terms of facilities, shops, infrastructure… and traffic. There were new shopping malls all over, and the stores were busy. The restaurants were excellent. The hotels I stayed in and spoke at were excellent and modern. The Sandton area is particularly pleasant. Durban is a tropical jewel on the Indian Ocean. Again, there was construction everywhere - a green, verdant city of 1,000,000 people, with modern roads and great weather. I have been to Sydney, Vancouver, and San Francisco. I love all of them. But for my money, Cape Town is the most beautiful city I have been to in the world. Amazing mountains, blue water harbours, white sand beaches, with wineries nestled in among the mountains and valleys. The Waterfront area, where I stayed, is fun and vibrant. Again, an amazing amount of construction everywhere, especially in the Waterfront area, as investors from Dubai are pouring huge sums of money into creating a massive residential/business/retail/restaurant development. There are several similar, quite large developments going up in different parts of Cape Town . I ate dinner on Friday night at a restaurant called Baia at the Waterfront. I find I really love the better South African chardonnays. My friends know I am something of a chardonnay snob. I like the better California wineries. I was pleasantly surprised to find more than a few South African chards the equal of their US counterparts, but at a third to half the price for the same level of quality. (I should note that a decent chardonnay in London or Europe is twice the US price.) The two of us had the best chardonnay in the restaurant and one of the better meals I have had in a long time, and the bill was less than $100. The next day my partner Prieur du Plessis informed me that Baia was one of the most expensive restaurants in town. By way of comparison, you can easily spend 2-3 times that at a comparable restaurant in Dallas , an d 4-5 times that in New York . Forget London. I began to ask about the bills for food, drinks, and such for the rest of the trip. The country was uniformly about half what I would pay in Texas for the same quality. I stayed in a very nice five-star hotel (The Commodore) for six nights for less than $1,000, including several meals, laundry, and my bar tab. Their walk-up price was much higher, but clearly you can get deals, and it is tourist season at that. The service was terrific and uniformly delivered with smiles. The exceptionally nice private game reserve (Itaga) we stayed at when I first arrived, trying to get over jet lag, was only a few hundred a night, including meals, wine, and game runs. In short, after having been to London and Europe for my last few overseas trips, South Africa seemed like a bargain. And it was not just the people I spoke to that were optimistic. Grant Thornton (a large international accounting firm) did a survey in the 30 countries in which they do business. The four countries with the most optimism and confidence were India, Ireland, South Africa, and Mainland China. Why such confidence? I think there are several reasons. The economy has been growing at a reported almost 5% a year for the past several years, which is quite strong. They have had 32 consecutive quarters of positive growth. But the official figures may understate the reality by a significant amount. If you look at the VAT (value-added tax) receipts, as well as other tax figures, some economists estimate the economy may be growing by 7% or more. Why the difference? There is a large “informal” economy in South Africa. While much of the income may not be reported, when something is bought and sold in the retail sectors, taxes are collected. The stock market has grown by over 25%, 47%, and 41% for the last three years. Such a bull run is always a boost to confidence. But there are also some real fundamentals underlying the emerging-market Bull markets. South Africa has a strong commodity sector, with numerous commodities and not just gold. JP Morgan thinks that earnings growth for South African companies, even adjusting for some anomalies, will be 20% this year, which should mean another good year for their local markets. This link between commodities and stock market prices is reflected not just in their stock market, but in emerging markets worldwide. Look at the close correlation for the last ten years between the prices of commodities and the emerging-market equity index. I think this rather clearly shows the link between the recent rise in commodity prices and emerging markets. It is more than just a China story. The attention paid to football (or soccer in the United States ) is rising to fever pitch in South Africa. And for good reason: they will host the World Cup in 2010. They expect some 3,000,000 fans to show up. The government is using the occasion to spend some 400 billion Rand (a little over US $50 billion) on all sorts of infrastructure projects. They are doubling the size of the major airports, which had already been significantly improved. Walking past the construction at the Johannesburg airport, you have to be impressed with the size of it. New roads and other forms of infrastructure are being added to prepare for the influx, but it will have the added effect of making the country more competitive, just as infrastructure in China has been a boost to that country, and a lack of infrastructure has limited India . The World Cup will also be a boost to tourism, already one of the most important sectors of the economy. Cape Town is becoming an international destination for vacations and conferences. The growth in tourism has been strong, showing 20% growth last year from 2005. 2006 was a record year. Interestingly, 75% of the traffic reported in the tourism growth is from Africa and the Middle East . While a lot of the people are vacationers, I think a goodly portion are businessmen and women from all over sub-Saharan Africa who look to South Africa as a deal-doing financial centre. South Africa has a quite strong, very competent, and growing financial services sector that is a magnet for entrepreneurs from all over Africa seeking to find capital. South Africa also has a strong entrepreneurial class which is the base for much of the new business and development, not just in South Africa but in all of Africa. The rest of the world rightly sees South Africa as the place to launch into the rest of Africa. Are there problems in South Africa? Of course, and some of them are quite serious. But that is the case in nearly all (I cannot think of an exception) emerging-market economies. While the overall crime rate is dropping, it is still far too high. Some rather high-profile crimes of late have resulted in a strong outcry for serious change. Corruption is an issue, but that is the case in almost every emerging-market country. The high levels of poverty are evident. Although employment is growing and more and more of the poor are being brought into the economy, there is still a lot of room for progress. The telecommunications infrastructure is hampered by a lack of serious competition. Access to the internet is limited in many areas, and it is really slow where it does exist. This will improve in the coming years, but it is a serious handicap to business. (Although, as this article is being published, a second telecommunications operator has been launched and is feverishly installing state-of-the-art infrastructure country wide). There are power shortages and the need for more power-generation plants to keep up with the growth. But all these areas are (mostly) going to improve. I see a lot of opportunity in South Africa in particular and Africa in general. Let’s look at one area where there may be more than a little potential in the future. I think there is deep long-term value in African (not just South African) farmland. Right now, given the nature of US and European subsidies to agriculture, it is hard for developing-world farmers to compete. But that will change in the next decade. As I have written before, “Old Europe” the US and even Australia are going to come under intense government budgetary pressure due to the high levels of pension and medical costs they have promised their retiring boomers. Europe is particularly vulnerable. Quite simply, Europe cannot afford to keep the pension promises they have made and pay for any other normal government expenses without raising taxes. Except that they already have economy-stifling high taxes. Budgets are going to have to be cut in other areas. At some point, sooner rather than later, agricultural subsidies are going to come under pressure, as politicians must decide where to find the money to pay for the promised pensions and health care. There are more voters who are older and on pensions than there are farmers. I can count votes, and it is not hard to predict the result. It will be with a lot of fighting, but in the medium run, the agricultural subsidies in Europe are going to have to go. When the writing is clearly on the wall, Europe will start to negotiate on those subsidies, trying to get something for what they will have no choice but to give. Part of that will be to reduce US subsidies as well. Africa will become a breadbasket for much of Asia . With China pressed for water and much of its agricultural land being used for development, China will need to import more food. And as the rest of the world becomes more developed, there will be an increased demand for meat, which means an even bigger demand for feed grains for livestock. The growing use of ethanol is increasing demand for corn, absorbing more of the world’s land use for energy corn rather than for food. The simple fact is that as the world grows more prosperous we are going to need more grain and other foods. Where is the land we are going to need to feed the world? There is an abundance in Africa, along with the needed water and labour. And as African countries upgrade their infrastructure, it will improve the ability of farmers to get their grains to market at profitable levels. Everyone of us engaged in the fascinating business of breeding thoroughbreds will have been intrigued at some stage or another by what it is that makes a good broodmare. Of course, we all have our individual idiosyncrasies when it comes to what we’re looking for in a prospective mare, and thank heavens it’s like that, or we’d all be after the same individual. It isn’t our intention here to deal with the physicalities or, for that matter, how we evaluate pedigrees in the selection of mares; we’ll come back to that at a later stage. For the time being we’re going to occupy ourselves with the question of where to source prospective mares. Most breeders of experience will tell you that when you’ve got a good family, stick with it, as it takes years to understand the peculiarities of a family, not only from the perspective of what type they throw, but also what sort of temperaments they have, how sound they are, whether the family needs speed or stamina, bulk or quality, etc, and to waste the patrimony of that experience is to set yourself back as many years as it’s taken you to get to know the family. So the best place in the first instance, when you strike gold in a family, is to persevere and develop it. “Family building” is a scholarly business, requiring plenty of patience, as well as a good deal of endurance. We’ve had families for example, that’ve looked quite dismal at times, but once we eventually found the right recipe, they’ve flourished into some of our best foundation stock. However, we don’t spend a lot of time trying to reinvent the wheel, only applying common sense and a set of principles that’ve served us well over the years, but which took a good deal of time in the making. The real purpose of this introductory piece on sourcing mares involves their origins. Analysis is a vitally important issue in the choice of breeding stock, whether you’re speaking of stallions or mares, and the best example of the value of analysis, in our view, lies in the exploits of Australia’s Arrowfield Stud, where the “bossman”, John Messara, with his stockbroking background and despite his relatively limited knowledge of the horse in the early years, resorted to analysis as his primary tool in assisting him in the selection of stallion prospects. Today his farm boasts the breeding of the stallion colossi Zabeel, Flying Spur and Danzero (all Champion sires,) while John was also the “maker” of the mammoth stallions, Danehill and Redoute’s Choice. Most students of the game remember Federico Tesio, the fabled Italian breeder and owner-trainer, for the fact that he bred the immortal foundation sires, Nearco and Ribot, as well as the highly successful stallion, Donatello, yet for all that great man’s exploits, John Messara’s record, particularly given the intensity of modern competition, is quite exceptional. So much for the value of analysis when it comes to the selection of stallions. In our wonderings, we recognized a quite significant but at the same time, perplexing phenomenon in our local breeding, and that involved the substantial disparities in the success of mares from different countries. While Argentina and New Zealand were for many years the sources of some of the best racehorses ever to come to South Africa, both male and female, it’s a strange quirk of nature that none of those great champions ever made a serious impact at stud, in the first generation at least. There wasn’t a single decent stallion to speak of and we can’t recall a single good horse from the phenomenal likes of Tecla Bluff, Taima Bluff, Dandy Sun, Solera, Époque, Ecurie, Bombarda etc. Of course, a South African-bred daughter of Tecla Bluff, Tecla Fields, is renowned for the fact that she produced three Group One winners in her own right, but that’s part of the point. Recent Equus Champion Elusive Fort, also comes from Argentina’s spectacular “E” family, but again, he was not a product of the first generation. It was the same with the litany of great fillies and colts that came out of New Zealand, and while the Australian bloodstock purchased in the same era was less successful at the races, these mares and the fillies from Europe, the UK and the USA, proved far more effective in the breeding shed. In recent years of course, with the advent of the shuttle, Australian-bred horses have come right into their own at the racecourse, and we guess we can anticipate, particularly with all the shuttle blood now available, that the “Australians” will really begin to shine as broodmare prospects, not that they haven’t already done well. So what is it that set the stock of these latter countries apart as “breeders” from those emanating from Argentina and New Zealand? There are any number of theories in existence, one of which involves where and how the bulk of them were trained, but it serves little purpose to deal in fairytales or old wives stories, so we need to look more closely at the stock from those countries, and in the end, try and find something practically connected with the blood, the type, and the environments prevalent in their areas of origin. As it happens, it would be easy to apply theories relative to where and how they were trained to any one group, but since the “Argies” and the “Kiwis” were largely conditioned in different yards, we have to assume that where they were trained had less to do with the final result, than is so often suggested. The environment : Anyone who’s been to Argentina and New Zealand will tell you they are spectacularly productive agricultural environments, and both the soil and the climate contribute substantially to the ease of farming in those regions. The result is, and this is a generalization, it’s much easier to raise stock in such a situation than it is in other countries where the soils are of a lesser quality, or where climate is an issue. For the purposes of this argument, we’re assuming that all horse-producing countries have a liberal sprinkling of quality horsemen, and while there may be disparities from country to country, the playing fields are fairly level as far as skills are concerned. The pedigrees : Looking at the pedigrees of horses in the various countries, another feature becomes especially evident, and that is these issues are often influenced by the ready availability of cash. The northern hemisphere has never been short of money, and they’ve always been able to afford the best genetics. In the Antipodean countries, Australia has been the “richer” country compared to New Zealand, and whilst as colonial entities, neither commanded the wealth of their masters to the north, Australia always had more “disposable” than New Zealand. It followed that the Aussies were able to afford more expensive and more fashionable genetics, where New Zealanders had to “box smarter”. This is no slight on Australia at all, as they have some exceptional horse people in that country, but the truth is, money often breeds complacency because you can occasionally get away with the acquisition of what you need to make yourself successful, whereas you can’t do that when you can’t afford it, in which case you have to work harder at other things to achieve the same result. Realizing that they could never afford the sort of genetics their Antipodean neighbours could, and since they were competing for much the same market, New Zealanders opted to breed a tougher, stouter horse of greater stamina, while the Australians went for the more fashionable, speed-orientated type whose aptitude was better served by a trip of six to eight furlongs. In very broad terms, it was this simple differential that enabled New Zealand for so many generations to dominate the longer distance races at the highest level in Australia, while they couldn’t get in much of a blow when it came to the shorter races in that country. Coupled with an exceptional environment and a generous climate, New Zealanders were able to produce a robust, durable, long-winded individual, and while it lacked precocity in the main, it was capable of training on for several years. By contrast, the Australian thoroughbred was typically early-maturing, extremely quick, and “shorter lived”. Turning for a moment to Argentina, in the 1920’s and 1930’s, in a world in which agriculture was one of the dominant economic activities, this phenomenally fertile country became one of the richest in the world, and Argentineans were able to acquire, particularly from the United Kingdom, some of their best bloodstock, including a long line of winners of England’s greatest race, the Epsom Derby. Consequently, when times changed and military dictatorships intervened in the government of Argentina, as the direction of the international economy moved from agriculture towards a more industrialized profile, so Argentina’s cash resources declined in relative terms, and so did their purchasing power relative to thoroughbreds. As a result, they relied heavily on the blood they had imported in those earlier years, and proceeded to concentrate on the breeding of their own stallion and broodmare prospects, with very little reliance on imports. Yet they continued to produce an exceptionally strong, resilient individual which was a product of local breeding and a staggeringly generous environment, and which never appeared to lose its vigour and vitality. By the 1970’s, New Zealand was heavily endowed with the sort of staying blood the northern hemisphere had come to shun and Argentina’s pedigrees were barely recognizable outside of Argentina and its immediate South American environs. For all that, horses from both countries came to South Africa in big numbers and they succeeded in droves, principally because they were tough and could take training, and certain of the people that had them knew how to exploit their attributes and get them to maximum fitness. For all that, as we’ve already said, they disappointed when they got to the breeding shed. How do you explain this? Well, it’s one helluva question and we guess it will exercise the minds of breeders for much longer than it’s taken to get a treatise of this nature published. For what it’s worth, this is our view. We’ve already mentioned that the richer countries were possessed of the “richer” blood; that is, horses descended from the world’s best families and by the most fashionable stallions. Consequently, from a purely genetic perspective, these countries were extremely well served and their blood, when exported, appeared to be adaptable and capable of “breeding on” in several different environments. Our theory on the “Argentineans” and “New Zealanders” is that, notwithstanding their success on our racecourses, when they got to the breeding shed, the blood just didn’t possess sufficient depth to maintain itself in a more testing environment, so these horses tended to breed “down” sooner than those of higher pedigree. In other words, the “Argies” and the “Kiwis” were products of two of the best agricultural environments in the world, and their ability to breed on in more testing areas, or for that matter in areas that were unfamiliar to them by contrast with their own environment, meant that they were not able to carry their legacies to the next generation as successfully as they had in their home countries. You might well ask then, whether the status quo has changed, and while there is little analytical evidence to suggest it has, it’s worth noting that both New Zealand and Argentina today are also the beneficiaries of the shuttle stallion phenomenon, and that they’ve both shifted their ground from being primary sources of stamina to the producers of horses that are beginning to look increasingly like their neighbours, in the case of New Zealand, Australia, and in the case of Argentina, the United States. In some respects, this is a sadness, as it means the archtypical thoroughbred from each of these regions is beginning to look less and less like the animal which forged the nation’s reputation, and more like one from the northern hemisphere. While this is a process which will take some time to achieve its complete manifestation, right now it appears to be irreversible. That said, from a purely South African perspective, there remains a prejudice against breeding with blood from these countries, which may well herald a window of opportunity to seize whatever pricing advantages may exist in the acquisition of South American and New Zealand bloodstock, particularly with the advent of the shuttle, and before they emerge as successful progenitors in the first generation. This is particularly so as stock from Australia and the northern hemisphere is becoming increasingly less affordable on account of the relative strength of their currencies. Of course, we mustn’t forget that our own stock can hold its own with anything from abroad, especially as it’s been tried and tested on our own racecourses. But if you’re looking for genetic variety, as a broad rule, you can source some serious “ink” in foreign pedigrees, (though coupled with racing class, that can be expensive,) and if you’re seeking performance, most times you’ll get far better value at home. “Jy gaan jou vrek vergader” : You’ll kill yourself with meetings! Readers might be forgiven for thinking (and especially those waiting upon return phone calls) that the boss, Mick Goss, does little besides attend conferences. Tuesday he departed for the Echo Travel International Conference in Franschhoek in the Cape, (where he had the daunting task of having to occupy the shoes of his deeply-lamented pal, David Rattray, arguably the best orator and story-teller of all time.) Some 80 of the world’s top travel operators were there to hear the tales of Hartford House, Fugitives’ Drift and the marvellous Land of Legends, and then it was back on the plane for Zimbali, just north of Durban. This spectacular coastal resort is the gathering ground on this weekend every year, of 75-odd of the Nation’s top businessmen, politicians and occasional government officials at the Moneyweb Ibandla, where the doors are closed (Chatham House rules, please) and some of the year’s most serious talking takes place. In an environment where the notion of “what goes on tour, stays on tour” is strictly adhered to, and in an atmosphere conducive to open discussion, the land’s most powerful and influential trade ideas on the country’s expectations. While the conference only begins today, last evening luminaries of the ilk of Mark Lamberti (Makro, Massmart etc), Frederik Van Zyl Slabbert, Laurie Dippenaar (Rand Merchant Bank and Momentum), Paul Harris (First Rand), Andrew Feinstein (the “arms deal” whistle-blower), Eskom chairman and ex-Minister for the Environment, Valli Moosa, and Telkom chair, Shirley Arnold, had already “trickled” in. This is going to be one helluva show, and if you can believe it, the convenor, Moneyweb’s Alec Hogg, just returned from Davos and Warren Buffett’s Berkshire Hathaway A.G.M., will be taking up residence at our own Hartford House on Sunday evening as his own Ibandla shuts down, for the opening of the annual Summerhill Group conference, taking place this time on home soil from Monday. Alec Hogg’s address on Monday will obviously reflect on the state of the nation, but knowing him, it’ll be more about the big picture and the opportunities of this glorious land than anything else. And then we’ll get the chance to hear from our own home-grown talents who’ve elevated the Summerhill, Hartford and Vuma conference to one of our collective highlights of the year. By Wednesday’s conclusion, Mick Goss will have been conferencing solidly at three different venues, several thousands of miles apart for 8 consecutive days. Let’s hope the heading to this column has no application – though there may be those that might wish it! Another South African who appears to be regularly in the news these days, is Mike de Kock, whom we’ve been touting for many years now as one of the world’s best trainers of racehorses, if not the best. Mike is nothing if he’s not controversial, but it has to be said that a good deal of the flak he attracted in his early days, came not only from his own spontaneity (dare, we mention, his volatility!) but particularly from the fact that he was decades ahead of his time. Often enough, his views on racing as an industry, were controversial merely because they were at odds with what prevailed at the time, and while there was a combination of the “tall poppy” syndrome as well as the usual conservative concerns that these were the views of an upstart, in most respects, this man from the “deep south” has been vindicated in most of the things he believed in. Today, he is the most recognizable South African in racing anywhere in the world, and it’s no understatement to describe him as an icon of the game, not only here, but wherever racing is conducted. The UK’s Owner & Breeder magazine recently recognized his publicity value. Here are a few excerpts. “It was a good grounding”, he reminisces (of his time spent in the South African Defence Force) “Any work with horses is good grounding”. “You just don’t know how good these horses are in South Africa, but now South Africans are desperate to try their horses abroad. More and more, South Africa will become a nursery for gathering horses for international campaigns”. To thrive in Britain, Mike de Kock knows he must significantly adapt his techniques. He believes horses must be a deal fitter to race in Britain, whose varied racetracks are more demanding on a horse’s fitness. “You can go to twenty racecourses and you’ve got twenty different scenarios. But for me that’s what makes it so exciting. It’s very tactical; you’ve got to think all the time”. “What the English have is a deep genetic pool that perhaps gives them a bit more class. I can’t afford them, but I don’t mind working with the problem horses. I’ve been doing it all my life”. “If I’m told to invest in property, I head to the sales”. The South African thoroughbred has rapidly been gaining momentum, thanks in part to the Dubai Carnival, with many of them advertising their merits on a global scale since the start of the new millennium. Fine examples include, Spook Express, Alexandra Rose, Tara’s Touch, Crimson Palace, and Trademark and many others in Hong Kong, Australia and France. More recent Dubai winners include Victory Moon, Grand Emporium, Lucky Find, Oracle West, Wolf Whistle, Yard-Arm, Surveyor, and Jay Peg. STUD FEES : Is the top still sustainable? The one game that appears to have remained impervious to the financial world’s warnings of woe in the international economy, is the thoroughbred market. Across the length and breadth of the world, events during the past three month’s thoroughbred auctions point to a boom in prices on an unprecedented scale, and our piece on Australian stud fees last week, tells us that studmasters in that part of the world are as bullish as ever about the state of racing’s economy. A glance at those stallions whose owners have announced fees for the forthcoming season in South Africa, points to much the same, with all of Western Winter, Fort Wood and Jet Master still occupying the ethereal heights at R200 000-R250 000 a piece. There is a significant gap between those three and a trio of horses in Count Dubois, Jallad and Trippi (the Rupert’s new acquisition) on R100 000 a pop, while there have been significant increases for Silvano (R60 000) Captain Al (R70 000) and National Emblem (R80 000). One question remains: In a market as limited as ours, can breeders expect to make a consistent and reasonable return on R200k plus service fees, when there are three stallions sharing that market? Of course, the question is of academic value ultimately, to the extent that most “armchair” breeders are driven largely by perception (as is the case in Australia), and they will continue to pay whatever it takes in order to access those stallions that occupy the top of the charts, whatever the commercial consequences. The real world however, is the one in which professional breeders live and they have to keep asking themselves whether, in dedicating that sort of cash to one or two mares, they are not spending a disproportionate sum on a relatively narrow number of mares, at the expense of the broader herd. At the end of the day, the long-term viability of one’s stud depends upon the success of the farm at large, and it seems to make both commercial and strategic sense to spread the budget across a bigger spectrum of horses, rather than concentrating it so tightly, in the hope of one “big hit”, while raising the risk staked on those mares substantially in the process. In our experience, great stallions get almost as many ordinary foals as good stallions do, and that means that only the very best foals become proper money-spinners. For every “ordinary” foal you get by an expensive stallion, you start wishing you had ten by the horse that stands for considerably less, and for which you outlaid a fraction of the money. No doubt, there will be those enquiring as to when Summerhill’s fees will be announced. Of course, we’re not masters alone of these, as they require the sanction of some of our principals in Dubai, and that involves transocean discussion before we release them. It’s become practice for us to deal with them at the end of May, so for those of you who are looking forward to them, please keep that date in mind. Founded by the city fathers in 1886, Durban High School is an institution close to Summerhill’s heart, as it produced two of the original founders of Summerhill (as we know it), in Mick Goss, and whilst he was involved, brother Pat Goss. The 6th June witnesses the coming together of DHS graduates of 1968, who gathered here as fourth formers in the Chemistry class of 1966. The boss, still sporting a bit of hair (!) is fourth from the left. We have a number of old (very old!) DHS boys among our blog correspondents, all of them from a much earlier, and no doubt, envious, era! Barry Irwin (Team Valor) Right now Team Valor’s Barry Irwin ranks as the best picker of successful racehorses in South Africa, and it’s probable, on his present record, that he’s as effective as the best in the world. Amazingly, he’s an American living in America, yet his strike rate with South African horses locally and internationally eclipses that of any judge anywhere. There aren’t many racing entities with access to the talent of a picker of his calibre, and it’s little wonder Team Valor is as successful as it is. Quite apart from the Ipi Tombes, Crimson Palaces, Irridescences, and any number of other spectacularly successful South African fillies he’s taken abroad, no fewer than four out of the seven bought two years ago are already Stakes winners in South Africa. It’s a tribute then to the horses presented at this weeks sale, that despite the previous records which now lie shattered in the dust, Barry still maintains “it is the best value Thoroughbred market in the world. The world hasn’t cottoned on to it yet, despite your great performances in Dubai, and I think it will remain that way for the foreseeable future. I enjoyed myself again this time, and I’ll be back next year”. The shootout at the OK Corral ended last evening with all sorts of records being broken, and the R200,000,000 aggregate barrier penetrated for the first time. However, it wasn’t as easy as it seemed, with a somewhat inverted pyramid of money chasing a limited number of horses, and with the strength and depth in the quality of the animals for sale, and the slowing domestic economy, there wasn’t quite enough money in the Golden City to see every horse home. The result was a larger number of unsold horses than last year, but on balance, vendors had to be quite satisfied with the levels of trade. Barry Irwin (mikedekockracing) “This is the best value thoroughbred sale in the world,’’ said Team Valor International’s Barry Irwin after the hammer came down on the final lot at the 2008 Emperor’s Palace National Yearling Sale at Gosforth Park on Monday night. Barry Irwin, who purchased 13 foals at an average of R606 538, was fifth biggest buyer at the sale spending R7.885 million, and he added: “From my experience you would pay roughly twice the price for any foal at sales elsewhere in the world. The quality of this year’s bloodstock was superb, much better than last year when I noted in the media that the quality was really good. When the provisional figures were released, the sale fell only R350 000 short of the magical R200 million mark, but the aggregate was up 21% on the 2007 figure, while the average of R398 503 per foal was 19% higher than last year. 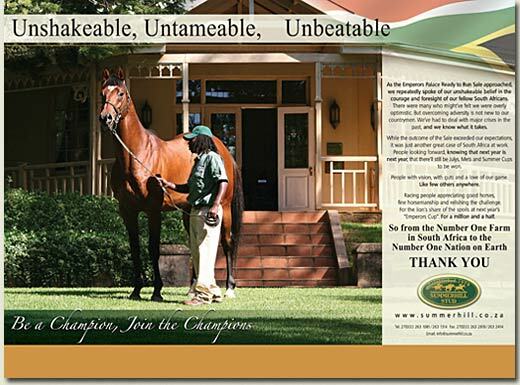 Highlands Stud was the top vendor by aggregate, selling 38 lots at an average of R510 132. The top buyer was Form Bloodstock, acting on behalf of various clients including Sheikh Mohammed bin Khalifa Al Maktoum from Dubai. They acquired 29 lots averaging R823 793. Champion stallion Jet Master topped the sires list with an aggregate of R24.94 million, or R489 020 per yearling, just shading his old rival Fort Wood, with Western Winter in third. Two fillies topped the sale at R3 million apiece, one a daughter of Royal Academy and the other of Western Winter. Spectrum was the leading freshman sire by aggregate, with 24 of his foals sold for a total R9.915 million, R413 125 per foal. VAR (13 foals, R4.37 million) and Victory Moon (16 foals, R4.005 million) also fared particularly well. An almost R200 million deposit will be made into the banks of South Africa’s breeding community. It comes compliments of horseracing owners of South Africa and around the world who have contributed to a sale that can only be described as a hugely successful Bloodstock South Africa run and Emperor’s Palace sponsored National Yearling Sale concluded in Johannesburg on Monday evening. The hard work by the team at Bloodstock SA as well as the South African Breeders who have invested in their stock over the past two years has paid huge dividends. Bloodstock SA took a massive risk this year by not replacing Byron Kennedy who was the 2007 marketing manager and chief strategist of the 2007 success but the 2008 team was ably led by Sales Manager Caroline Simpson, a long time servant of the company. South African Breeders can count on, the huge success of Dubai as well as the state of world bloodstock, for the upward curve. South Africa’s unstable currency also makes it easier to attract foreign money in a market still seen by the rest of the world as “cheap”. The quality of the yearlings was also of a standard never seen before as the breeders upped their game in the face of international competition. The rather large amount of pin hooked foals who sold as yearlings at the sale had an impact on the overall result, as did the injection of foreign damlines in a number of the pedigrees, not to mention some key international individuals who invested heavily in bloodstock this year. On the downside, South African Breeders are largely ignorant of technologies such as the internet and the international norm of showing yearlings off on websites - a technology that foreign buyers enjoy. Surprisingly, a large number do not understand that this can be used as a facility to showcase yearlings and hence provide the potential buyers with a refined list of yearlings to look at even before arriving at the sales. The other disappointment is the relatively low amounts breeders spend on advertising themselves. If South African breeding wants to attract and even more importantly, keep international interest, it needs to get out there and present themselves as a viable yearling market. The buoyant market won’t last forever, so while the industry is cash rich and thriving, the more done to promote the breed the better. South African Breeders are great at resting on our laurels as we have done so often in the past when the days of getting a horse sold for more than R400 000 was an effort. One also has to remember that the bloodstock world internationally has not suffered as world economies stumble - another trend that won’t last forever. Whilst enjoying the success of another great sale, it is also a time to re-invest, advertise and market the South African yearling. With careful planning and execution, we could have the whole world at our mercy. Jan Naude (mikedekockracing) The buoyant start to the 2008 Emperor’s Palace National Yearling Sale at Gosforth Park on Friday, continued on Sunday when six yearlings were sold for R1 million or more and the aggregate reached R140.63 million, an increase of 25% on the corresponding figure of 2007. The interest from overseas buyers continued on Sunday. The sales-topper was Highlands Farm’s Musk (Lot 179), knocked down to trainer Alban De Mieulle, who trains for the Prince Of Qatar. “I am thrilled with this purchase and we’ll be back,’’ said Alban De Mieulle, who paid R1,6 million for this handsome bay colt by Spectrum. Team Valor International’s Barry Irwin secured Lot 254, Toujour’s Aspen, by Fort Wood from Klawervlei Stud’s imported mare Toujour’s Elle, by Lyphard, for R1.5 million. Dr James Hay, a big buyer during the Select Session, bought more yearlings for trainer Herman Brown, including Giant’s Causeway’s son Storm Boy (Lot 212), for R1,1 million. Despite the strong international presence, the local buyers had plenty to choose from in the R100 000 – R500 000 bracket and there will be more purchases in this range when the last 250 lots come under the hammer at the Monday session, which starts at 11am.